It is amazing how many foot complaints people have today. This Infrared Foot Sauna is heaven sent. Many of those feet will love the refreshing heat from this infrared wood sauna. This Infrared foot sauna fits comfortably between your feet and the floor. It uses a tiny amount of electricity to give soothing warmth to your feet ~ perhaps under your desk. The Foot Sauna exterior is made of a special wood with its natural aroma. Temperature ranges from 25°C~65°C (77°F ~149°F) and evening time can be set up to 60 minutes. Infrared heat reaches 1.5 to 2 inches deep, and at higher temperatures can induce sweating. A perfect evening remedy for those who are on their feet a lot during the day! 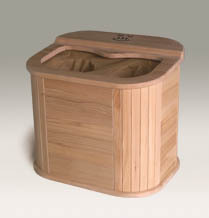 The Infrared Wooden Foot Sauna delivers gentle foot care. It can relax and rest tired feet, help you sleep better, maintain foot health and hygiene, assist sufferers of rheumatism and arthritis. You'll sleep better, work better. The Foot Sauna is part of a good hygiene and self-care routine, or a good adjunct to fitness and weight-loss programs. Verify correct power supply voltage. Plug into a socket and turn power switch on. Position the Foot Rest inside the barrel to its lowered position for using the Foot Warmer in a sitting position. For use while lying down, with the Foot Warmer lyling flatwise, swing the Foot Rest down so that it also lies flat. Place feet in the barrel. Ensure the Foot Rest is between feet and any part of the Foot Warmer to prevent accidental burning. Set the temperature dial to the level that you desire. Dial the timer to chosen time setting from 1-60 minutes. When finished using the Infrared Foot Warmer, turn the power switch off, unplug the device, and store in a dry place. Never pour water into the barrel. 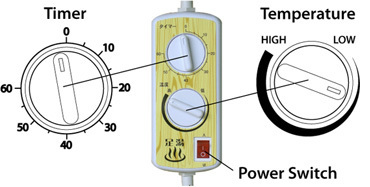 Note: Those with high sensitivity to heat should take extreme care to avoid overheating, and in particular to avoid leaving skin in contact with heating elements inside of Foot Warmer. Timer Control 0 ~ 60 min. The Infrared Foot Sauna is not a medical product. Not intended to diagnose, treat, cure or prevent any disease. If you are uncertain whether you can use this product, please consult your physician before using it.